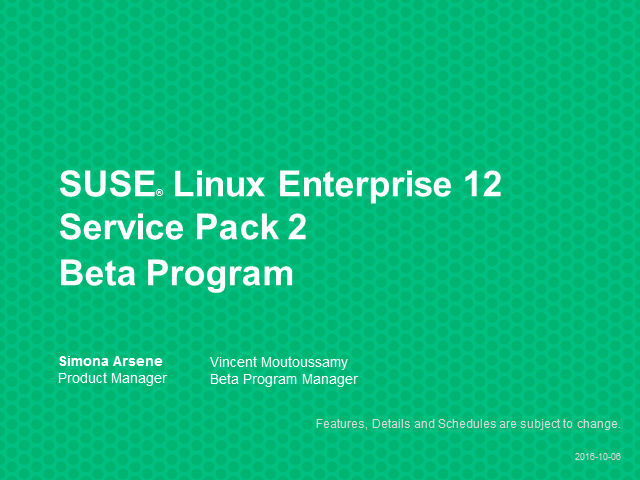 SUSE launched public Beta Program of SUSE Linux Enterprise 12 Service Pack 2 (SLES 12 SP2) earlier this year. Now we are approaching the end of the Beta Program. In this webinar, the SUSE product team will present the key features of Service Pack 2 and provide a sneak peak of what’s coming next. In addition, the SUSE product team will be available for you to ask questions and discuss your experiences. Attend the webinar, to meet with the SUSE product team, share your experiences and hear from other beta participants.